Franklin D. Roosevelt's New Deal made significant contributions to the USA's preparation for and engagement in World War II, as noted at this page at the Living New Deal. At first this was because FDR saw defense work, particularly shipbuilding, was an excellent way to hire lots of unemployed workers because it was so labor-intensive. It didn't hurt that he also had a deep affection for the Navy, having served as Assistant Secretary of the Navy under President Wilson. He also recognized the threats posed by Germany and Japan earlier than most other politicians did and, since Congress was unwilling to appropriate sufficent defense funds, Roosevelt used the New Deal relief agencies to achieve the same end. The Bronx campus of Hunter College was built with New Deal assistance, primarily the WPA, as explained HERE. 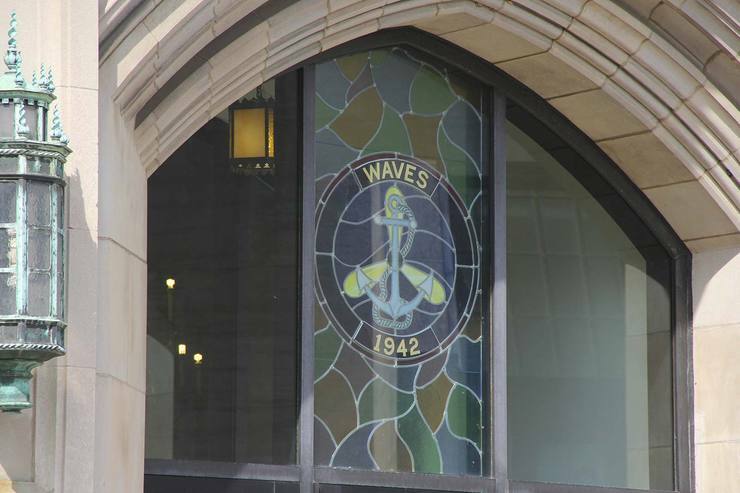 The connection of the Hunter College campus (which is now the campus of Lehman College) to national defense comes in 1943 when it was turned over to the US Navy to serve as its training center for WAVES (women serving in the Navy) for the duration of the war. "USS Hunter" turned out some 81,000 Navy enlisted women by the time World War II ended (WAVES officers were trained elsewhere). Interestingly, this is the first place that any branch of the US military became fully integrated, and the WAVES were still the only fully integrated service branch at the end of WWII. [2,p.88] Also about 14,000 SPARS (Coast Guard women) were trained at the Hunter Campus and at least (as of 1941) 3300 women Marines. By March 31, 1944, 48.5 of all Navy personnel were women[1,p.8]. "Navy Service: A short History of the United States Naval Training School (WR), Bronx NY", Public Relations Office, USNTS(WR), 190 pages (1944). McGregor, Morris J. "Integration of the Armed Forces 1940-1965", Department of Defense, Defense Studies, Center of Military History, US Army, Washington DC (1981), printed by the US Government Printing Office. Hunter College, Wikipedia, accessed 11 July 2018. "A Maritime History of New York", New York City WPA Writers' Project (1941), 2004 Going Coastal edition with epilogue. 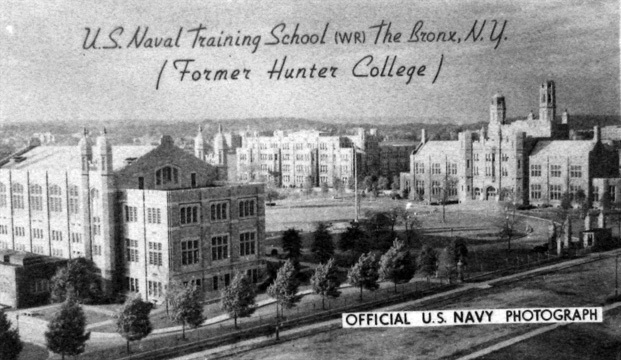 Navy WAVES Training Gallery at my family history website (scroll down to the Hunter College section). 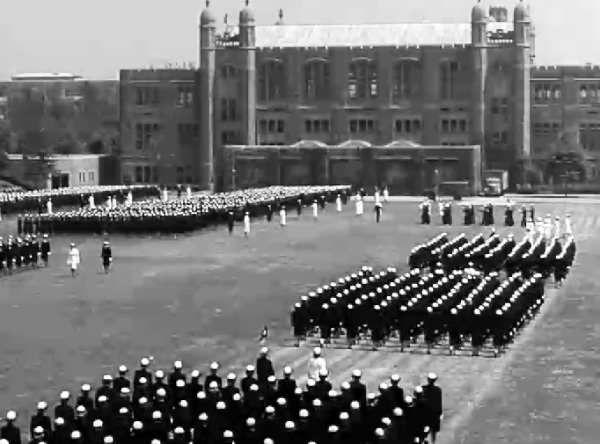 Boot Camp in the Bronx, New York Historical Society video (2012). The Public Works Administration (PWA) gave out grants and loans to government agencies at all levels (state, county, city) and to federal agencies including the Department of the Navy to hire contractors to do whatever was to be done. As of June, 1939, the PWA had paid for the construction of 60 naval vessels ($239M), 99 Coast Guard vessels ($26M), and 48 military aircraft ($19M), plus machine tools for navy yards ($4M), housing for defense workers ($137M). Plus (as of January 1937) another $28M on military infrastructure. The amount of PWA funds dedicated to these projects would be about eight billion 2018 dollars. This does not count hundreds millions of 1930s dollars spent on infrastructure required for national security and defense, but outside of military bases: highways, tunnels, water systems, dams and levees, electrical grids, navigation aids, docks, air fields, surveying and mapping, and so on. The "PWA Fleet" is the second largest in the Western Hemisphere, exceeded only by the U. S. Navy itself! In 1933, the Public Works Administration allocated $238,000,000 to the Navy for the construction of naval vessels. ... Together with the Navy aircraft obtained with PWA assistance this makes a very strong naval force ... The cruisers Vincennes, Philadelphia, Savannah, and Nashville were all ordered in 1933 and commissioned in 1937 and 1938. Thus the Vincennes should join the Phelps, Clark, Moffett, and Balch as PWA ships built at the Bethlehem Shipyard in Quincy, MA. Even so, that comes to only 37 ships: what were the other 23 and where were they built? (I suspect that many of them were landing craft (LCVP, LST, LCM, LCC, LCM, LCI, LCS, LVT, LCU, etc). Meanwhile we know the PWA paid $26,458,450.00[2,3] for 99 Coast Guard cutters, but beyond that the details are still not clear. There is the cutter Fir (WLM-212), built at Moore Dry Dock Company, Oakland CA, at a cost of $389,746 paid by the PWA, launched in 1939. The Brooklyn Daily Eagle (6 July 1936, p.4) mentions two cutters, the Alexander Hamilton and the John C. Spencer, under construction at the Brooklyn Navy Yard. Three down, 96 to go! Until the missing PWA Federal Projects records turn up, we make do with various New York Times announcements of PWA allotments for the Coast Guard[7,8,9,10,11]. But we don't know which cutters they were or where they were built. Meanwhile, millions more PWA and WPA dollars were spent to strengthen Coast Guard bases and shore facilities and to enlarge the Coast Guard Academy[2,p.41]. I haven't found a list of aircraft yet, but Millions for Defense[2,p.5] says that more than 100 military planes were purchased by the Army Air Corps out of a PWA allocation of $7.5M, mentioning that among them were some Martin B-12 bombers. Since Millions for Defense was published later than America Builds, its totals for Naval aviation are higher: "From PWA grants of $7,496,923 for naval aeronautics, 130 new planes have been built for the Navy ... The planes are of different types, ranging from little bulletlike fighters to the majestic flying boat patrols. "[2,p.9] Of course these are tiny numbers of aircraft compared to those produced after Pearl Harbor, when there was no longer a problem getting military appropriations from Congress. New military airfields (both Army and Navy airports) were built, old ones modernized and expanded. "The cumulative expenditure of Federal emergency funds for military airports has exceeded $22M"[2,p.7]. Besides ships, aircraft, and airfields, the PWA also invested in Army posts ($130M)), Army motorization ($10M for cars, trucks, motorcycles, tractors, trailers, etc)); Army facilities ($8.8M for machine shops, arsenals, proving grounds); military hospitals; and in military infrastructure. Reference 6 lists a total of $28,100,238.25 allocated under NIRA (the act that authorized the PWA to grant funds for defense spending) for "miscellaneous projects at navy yards and naval stations" (as opposed to the building of ships) as of January 31, 1937. These expenditures were for repairs, overhauls, upgrades, construction, etc, as well as for trucks, cranes, booms, trailers, locomotives and rail cars, etc, and for roads, water and electrical infrastructure within the Navy installations, all listed in detail. Millions for Defense puts the figure for new construction at Naval bases at $65M[1,p.21]. Bear in mind when reading these figures that a 1930s dollar is equivalent to about 18 dollars in 2018. Stobo, John R, The New Deal Yard, 1933-1937, Part 2, Columbia University, October 2004, which quotes from Thompson, H.I., Inspector of Naval Materiel, “Ships Under NIRA”, letter of 20 September 1933 to commandants of the Navy yards, RG181; National Archives, Northeast Region, New York, which lists each ship that was to be built and at which yards (CL = cruiser; DD = destroyer; PG = gunboat; CV carrier). Millions for Defense: Emergency Expenditures for National Defense 1933-1940, US Federal Works Agency, Washington DC (1940). America Builds, The Record of the PWA, Division of Information, Public Works Administration, US Government Printing Office, Washington DC, 1939, Table 20, pp.290-291. U.S. Coast Guard Cutter Fir (WLM-212), Historic American Engineering Record, National Park Service (2001). Public Works of the Navy, Bulletin No.38, May 1937, US Government Printing Office (1937). Public Works of the Navy, Bulletin No.39, June 1937, US Government Printing Office (1937). An allocation of $14,800,00 to the Coast Guard for equipment to combat an anticipated increase in smuggling activites following prohibition repeal was made today by the Public Works Administration. It will provide for immediate construction of seaplanes, patrol boats, and cutters ... $1,895,000 for 31 seaplanes ... In addition to the seaplanes and cutters, today's allotment also provides for immediate construction of nine patrol boats to cost $2,250,000 ... Three of the six new 300-foot cutters will replace the Senec, Snohomish and the Yamacraw, each of which is more than twenty-four years old. The other three will base on Coast Guard stations at San Pedro, the Canal Zone and Unalaska, Alaska. In this country the Coast Guard has become, or is fast becoming, our auxiliary navy ... the Secretary of the Treasury announced late in January that the Navy Department would build for the Coast Guard seven "gunboat" cruising vessels." These projected ships, two of which are to be built in the New York Navy Yard, four in the .... are to cost $13,500,000 and are to be the sister ships of two naval gunboats, the Erie and Charleston, now being constructed ... In addition to these ships the Coast Guard is building five cruising cutters of the Escanaba ice-breaking type. PWA announced today that five cutters, nine patrol boats, four tags and ten new amphibian planes had been completed and assigned to service .. The administration said that seven more cutters, the largest vessels ever used by the Coast Guard were also under construction with public works funds. The will be eighteen months in building and will be equipped to carry one plane on their decks. The President has approved a recommendation made by the Advisory Committee on Allotments for the Works Program for the allocation of $5,263,995 for the building of patrol boats .... a substantial addition to the Coast Guard's "mosquito fleet" that patrols the inshore waters... Under a previous PWA allotment the Coast Guard was allotted $25,000,000, for the construction of ships, repairs to shore stations, and other purposes. For new construction, PWA funds are being used to build nine 165-foot patrol boats, five 165-foot cruising cutters, and seven 328-foot cruising cutters. Public works projects which call for an expenditure of $60,000,000 and are expected to provide work for more than 50,000 persons were approved today by the Federal Emergency Administration of Public Works. The allotments go to flood control of the Mississippi River, construction and repair work at naval shore stations and yards, the building of cutters for the the Coast Guard, repair of the Statue of Liberty and construction and repair of Veterans Administration buildings ... The naval allotment was $13,600,000 ... This makes a total of about $251,000,000 set aside for the navy under the public works program, $238,000,000 of this being for the construction of cruisers, aircraft carriers, destroyers and submarines. The naval sum specified today will be spent as follows: ... New York Navy Yard, $849,000 ... The allocation for the New York Navy Yard provides $475,000 for improvement of the power plant, $24,000 to improve the telephone system, $50,000 for extension of the the structural shop and $3000,000 for new travelling drydock cranes. ... The allotment for construction of new Coast Guard cutters and repair and equipment work totals $8,501,190, of thich $7,050,000 is for new cutters, all of them for service in Northern Atlantic zones. The strong isolationist sentiment in the 1930s [not to mention the Great Depression!] resulted in chronic underfunding of defense ... From the mid-1930s on, public works money was directed to the military to provide some measure of relief. In 1934, a grant of $10 million from the Public Works Administration was used to buy motor vehicles for the Army. In June 1935, a total of $100 million of PWA funds was allotted for the War Department; of this amount $68 million was for military construction. By June 1940, the Works Progress Administration alone had spent $432 million in cooperation with civilian and military sponsors on such national defense projects as airports, highways, bridges, rail lines, Navy yards, and the refurbishment of several military bases. New York Times Headline: NYA Has Hundreds in Shipyard Shops... Staten Island Project Is in an Old Yard Having Also Three Drydocks and a Basin ... One of 6 Workshops Here ... Largest is Astoria Center, Where 7,487 Boys and Girls Have Gone in Five Months. A recent survey brought forth the conclusion that 261,500 new workers would be needed in American shipyards up to November, 1942, for naval construction alone. Where are they coming from? The National Youth Administration, set up in 1935 as a relief agency under the Work Projects Administration but now a full-fledged unit in the United States "total" defense front, is attempting a partial answer to the question in its shipyard project at 1435 Richmod Terrace, West New Brighton, Staten Island. The NYA leased last December from Frank McWilliams, Inc., an old shipyard there on the shores of Kill Van Kull where yesterday 700 boys ranging in age from 17 to 24 years were busy learing the rudiments of the trades which go make up a shipyard crew. Already fifteen boys have gone from the project to full-time jobs with shipbuilding companies in the Port of New York vicinity. ... The shipyard project is only one, and one of the smallest, of the six workships operated by the NYA in New York City, which, with Long Island, makes up the only administrative unit in the NYA not Statewide in scope. In number of enrollees, a number which reached a high of 26,000 last month but is now being cut to 19,000, it is second only to Pennsylvania. Largest of the workshops is the Astoria Work Experience Center at 43-02 Ditmars Boulevard, Astoria, Queens. There, in a building leased from the Steinway Piano Company and covering almost two acres of ground, are situated seventeen work units. Working two shifts of six hours each day and two shifts a month — a week on and a week off — 7,487 young men and women have been trained in the center from Oct. 1 to Feb. 13. ... Here, as elsewhere through the country in the NYA's more than 4,300 workshops, the young men and women are actually working at something constructive. Work comes to them from the Army and Navy, from city and State departments and other public agencies." NYA Has Hundreds in Shipyard Shops New York Times, 5 Mar 1941, p.10. How the NYA Has Been Converted To Advance the War Program, Brooklyn Daily Eagle, 25 Mar 1942, p.14: "[NYA] reports 16,000 machine shops in operation [in the USA], giving work training to 65,000 young men and 10,000 young women ... NYA reports that ... its large [machine] shop at Astoria, L.I., has turned out 32,000 parts for the Brooklyn Navy Yard in three months." La Guardia Lauds NYA Training Plan, New York Times, 19 Dec 1942, p.24: In Harlem, the mayor "watched a class of thiry youngsters operate machines turning out material used in the Navy Yard at Brooklyn, and then praised the NYA for its constructive work." Aubry Williams, national NYA administrator, declared that "NYA was turning out 10,000 trained youthful workers into war industry every month and that he would renew his request for the $60,000,000 appropriation now given by the Federal Government for the program." The Works Project Administration (WPA) differed from the PWA in that it did the work itself, hiring unemployed workers and buying materials directly. Intro, discussion of CCC and WPA records, history of CCC, history and overview of WPA and its precursors: FERA, CWA. WPA role in national defense, examples of defense projects. Continues with examples of defense projects. Discussion of National Register categories and historic properties. List of references. Inventory of CCC and WPA records, index to microfilm rolls and reference cards at NARA. Table B-1: List of CCC Projects on Military Installations starts. Case study: NAWS China Lake (cont'd)... and then the public information booklet. The public information booklet by itself. * The New York City entries from Table C-1 have been extracted from the PDFs into a searchable, sortable HTML table, included below. The CCC tables B-1 and B-2 include dates but have no project ID numbers or dollar amounts. The WPA tables C-1 and C-2 have project ID numbers and dollar amounts but no dates. Also the WPA reports show the project's county and town, the CCC reports do not. I had found the booklet and Report-1, but did not know about the other other pieces; thanks to Evan Kalish of Living New Deal for passing them along. Army: Fort Wadsworth (Staten Island): 20 July 1935 – 8 Oct 1937: Road Construction, landscaping and developing, construction of sea wall, forest improvement, truck trails, soil erosion control, grading and clearing. None are shown in Table B-2. Richmond County is Staten Island. Fort Jay (1784-1997), while in the Borough and County of Manhattan, is actually on Governors Island (it was erroneously placed in Queens in one entry). The North River was another name for the Hudson; in the original table it was mispelled as Worth River. The New York Navy Yard and Brooklyn Navy Yard are the same shipyard, I used the former name in all entries. Fort Totten is in Queens; it was erroneously placed in Suffolk County in one entry. Column headings are the same as in the original table. Table C2 is a repeat of the Table C1 for only those projects that were still under military control as of 2009. The initial order of the table matches that of the printed table. You can sort the table on any column in ascending or descending order by clicking on the desired heading once or twice. The most useful sorts are by County, Location, O.P. Number, and Funds. The O.P. Number indicates the WPA record at the National Archive where details about the project (if any) can be found on microfilm or paper files. It will be noted that none of the WPA projects in Table 2 involve direct involvement in shipbuilding or other war-related manufacturing. Report on Progress of the WPA Program, Work Projects Administration, 30 June 1940: "The ERA Act of 1935 and subsequent appropriation acts definitely prohibited the use of WPA funds for munitions, warships, or instruments of war, but permitted the construction and improvement of buildings and airports and other types of construction and nonconstruction work on military or naval reserversions ... Many projects operated by the WPA had been sponsored by the War and Navy Departments, the Coast Guard, and the National Guard." NY New York New York Army -unknown Alter and rehabilitate U.S. Army building on Whitehall Street, including modernizing water system and plumbing, removing old and installing new plumbing fixtures, painting, doing electrical work, placing metal partitions, improving roof and fire escapes 765-97-2-27 23,430.00 District Engineer, Corps of Engineers, U.S.A. Methodology: The PDF Report-3 and -4 files were uploaded to Linux. A utility 'pdftotext' exists there that extracts text from PDF files, but the results for tabular material are hopelessly scrambled. Therefore each New York City table entry was copied with the mouse from the PDF document and pasted into an EMACS buffer, set to "auto-fill off" and a fill-column of 1000 so the rows would not "auto-wrap". As usual with copy-paste from PDFs, a line break appeared after every word and also around every hyphen. Each entry was then manually "filled" into a single long line and then a slash character (/) was inserted between each field. This was a manual operation for the first four columns and automated for the last four with an EMACS macro, which (among other things) identified the O.P. number and removed spaces from it. Then a program was written to turn the slash-separated fields into HTML table rows and columns. Extracting all the New York City entries took about six hours. To convert all of Table C1 to HTML would probably take two or three full days using this method.